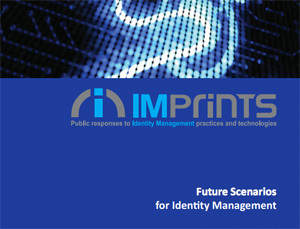 Imprints (Identity Management – Public Responses to Identity Technologies and Services) was a three-year comparative and multidisciplinary research project, interrogating the influences on UK and US public’s to engage or not with identity management practices, services and technologies of the future. These involved new forms of biometric authentication including innovative ‘smart’ tokens like ID or customer cards, jewellery, garment, or further enhanced smart phones. These technologies have become subject to paradoxical processes of acceptance and rejection. For example, there is concern about electronic patient files, but people share many personal details via social media. The research gained a better understanding of these paradoxes in order to facilitate public debate, policy development and user-centric applications. The project examined how these expectations were represented in specific scenarios, which were then intensively discussed with the public in order to map and understand their desires and taboos. A final project report was published in September 2014, beneficial to government, commercial and civic stakeholders in the UK and the US. My input to the project was closely aligned to my undergraduate work as wearable technology was a major influence in prototyping possible future identity management scenarios. We produced prototypes for use with focus groups & in public exhibitions. These in turn helped to generate research data, in the form of responses to them, from the focus group participants & the general public. The prototypes utilised RFID tags, the Arduino and Electric Imp micro-controller platforms & the Aurasma virtual reality (VR) app. These allowed us to create a number of prototypes that demonstrated possible future IM scenarios. I also co-authored the following. Gomez Flores, L., Wilson, S. and Kinnear, D. (2013). 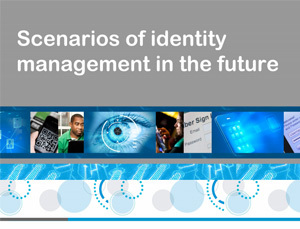 Probing identity management – preliminary findings. ACM Digital Identity Management Workshop, Germany, 8th November 2013. Wilson, S. and Kinnear, D. (2013). Beyond the Flatlands: Printing in 3D. Presentation to Panel, Impact 8 International Printmaking Conference. Dundee, Scotland, 28th August – 1st September 2013. Wilson, S., Gomez Flores, L. and Kinnear, D. (2013). hackJams – (re)-Designing the Future of Identity Management (and the Design Competition). Paper presented at the 5th International Congress of International Association of Societies of Design Research (IASDR). ‘Consilience and Innovation in Design’. Tokyo, Japan, August 2013.